allows fast modeling of concurrent hardware modules at the cycle-level accuracy. corresponding to a given network configuration, a certain traffic pattern and load. 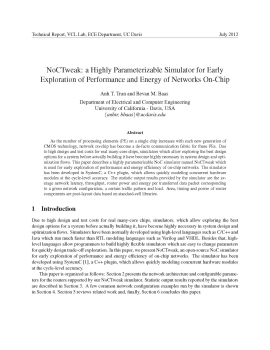 "NoCTweak: a Highly Parameterizable Simulator for Early Exploration of Performance and Energy of Networks On-Chip,"
Technical Report ECE-VCL-2012-2, VLSI Computation Lab, ECE Department, University of California, Davis, July, 2012.